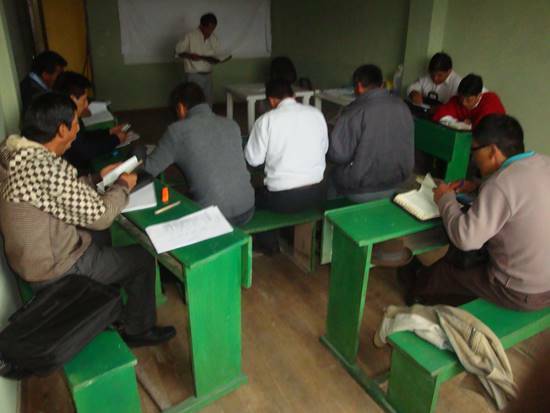 NEW How Shall They Hear Without a Preacher in Ecuador? 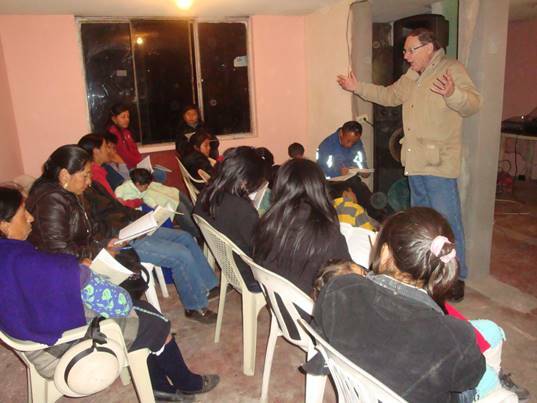 Wil teaching a group of new believers in a home church in the town of San Juan Guaboc, Ecuador. 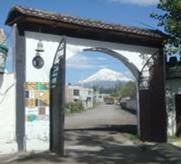 This is the only evangelical church in a large rural area serving several communities 30 minutes from Riobamba. "The churches were being strengthened in the faith, and were increasing in number daily" (Acts 16:5). I love surprises. Especially when the surprise is an opportunity to preach the Good News of Jesus Christ. Early Sunday morning in Riobamba I completed my daily 3 mile walk at the hotel and saw some Quichua youth standing around talking. 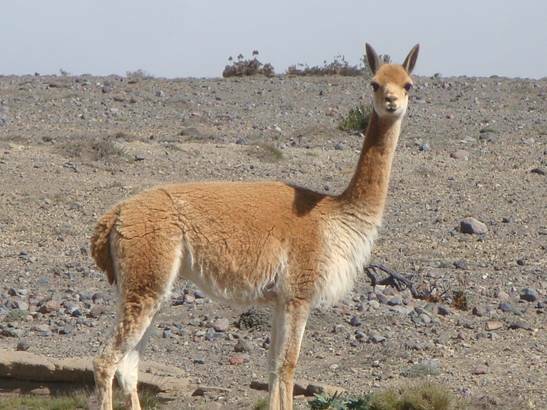 I introduced myself and discovered that they were from Alausi. These youth were here for a World Vision sponsored conference on personal evangelism from a Gospel Missionary Union church in Alausi. The sponsor of the group asked me to give a presentation on witnessing. What a joy! They were extremely attentive. I used Matthew 28:16-20 to encourage them in their walk and witness for Christ. 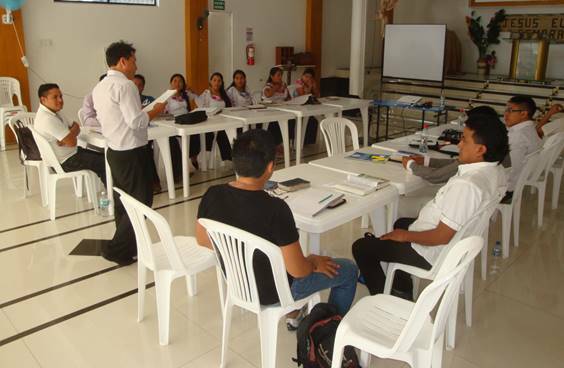 In the port city of Guayaquil, I taught the 40 hour Peniel Theological Seminary course on the Gospels and Acts. This is one of my favorite group of students and my third course with them. They are always focused, and they have plenty of provocative questions and discussions. 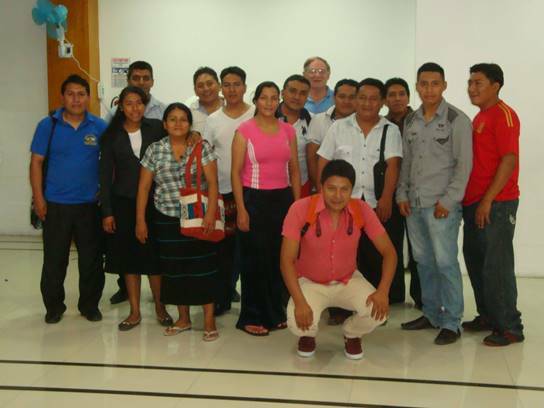 Guayaquil students in the Gospels and Acts. The following Saturday we drove five hours to Guaranda where Alejandro Guacho teaches two courses each Saturday at the Peniel extension. He is currently teaching courses on the Gospel of Matthew and one on the doctrine Salvation. Since it was near Easter, he asked me to give a presentation on the Harmony of the Crucifixion and Resurrection of Christ. 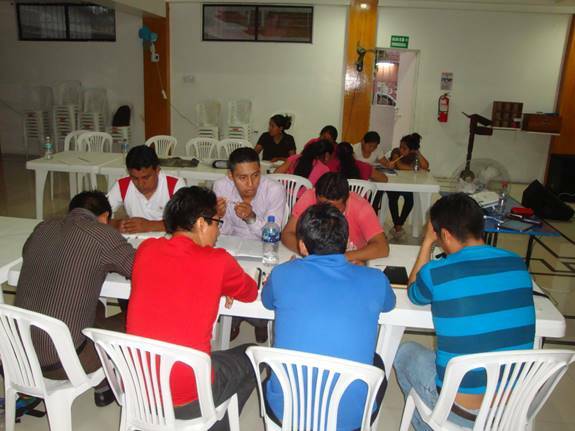 Peniel extension students in Guayaquil taking final exam on the Gospels and Acts. Small group activities in the class on Gospels and Acts. Student presentation in class on the Gospels. 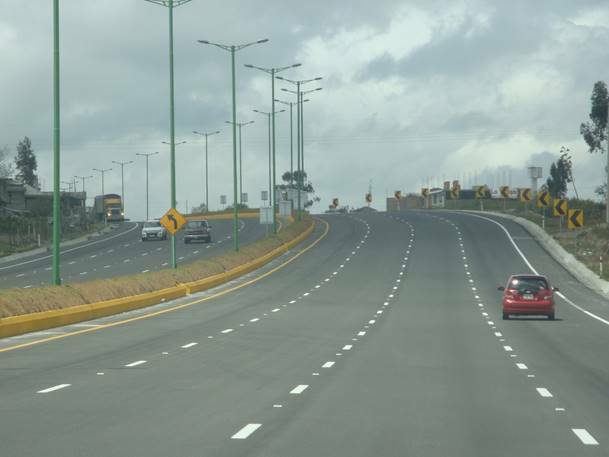 Modern major highways crisscross Ecuador from the sierra to the coast and from the Amazon to the Pacific. 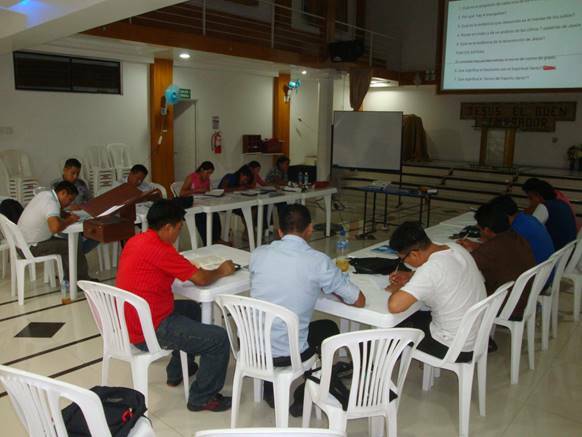 Partial view of the class on Matthew at the Peniel extension in Guaranda. The pastor who coordinates the Peniel classes in Guaranda invited me to speak on evangelism in his church. I also have an invitation to return later this year and speak to the leaders of the churches in Bolivar Province on Bible doctrines, church practice, and organization. There has been an excellent response from the pastors here on previous occasions. As I return to these areas, I feel like the apostle Paul must have felt when he returned to the churches he had started. 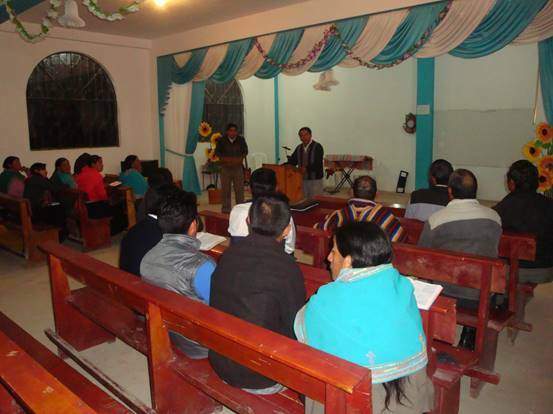 I always have a standing invitation to preach at Alejandro's church in Riobamba. On this trip I preached on the rapture of the church. Wil speaking on personal evangelism in a church in Guaranda. A group of engineers, teachers, university, and high school students started a church in a home two months ago. 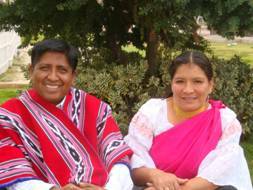 They began by watching videos of Alberto Copa's preaching. Then they asked Alberto to come and help them start a church. Alberto's two sons and his daughter and her husband and some Peniel Seminary students hold worship services and have a discipleship class of 20 persons who are being prepared for baptism. I spoke to this group each night for a week on the Roman Road and basic doctrines of our faith. Some of the new believers discipleship class with professor Damaso at upper left. 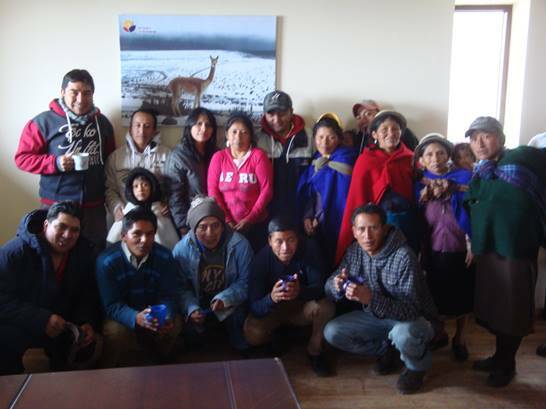 Genesis Bilingual Evangelical Church continues to grow in its outreach in Riobamba. Majestic snow capped peaks of Mt. 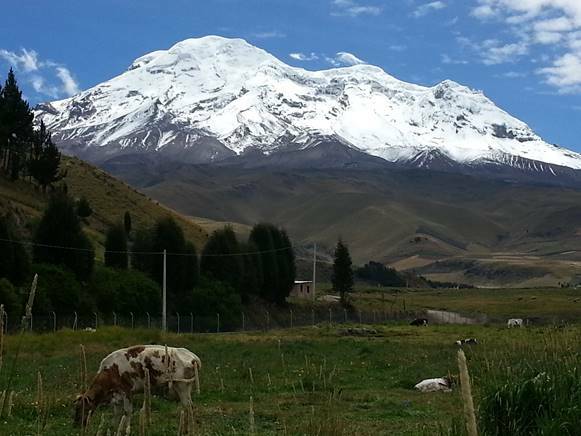 Chimborazo, Ecuador.